Update 8/5: The issue mentioned below where the image was not aligning has been fixed. Update 11/12/12: Embed anything recently announced that it would be closingsabwsvqqtwvuuz, all code has been removed from this page. Embed Anything, formerly known as EmbedArticle, has added a new feature to its service that makes images easily embeddable into other sites. Given how widespread image misuse is and how quickly the issue is growing it is easy to see why a service such as Embed Anything may be very tempting. But is it the right service for artists seeking to protect and profit from their work? The answer greatly depends on the type of work you create and the kinds of reuse you wish to permit. Once you have added the code (or installed the WordPress plugin), images on your site will have an overlay that will appear once the user scrolls their mouse over the image. 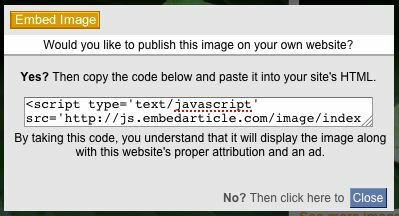 It’s a simple yellow box that says “Embed Image”. 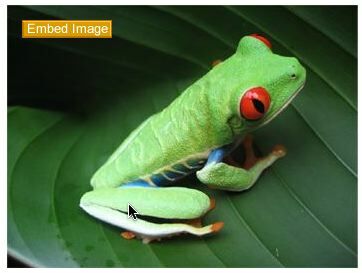 Clicking that box sill open up a small popup that will provide the embed code for the image and offers a disclaimer about what the embed does. The user then copies the code into their site or post and the image appears with an attribution line underneath and an ad overlayed on top of it. Content creators can edit their advertising settings in their account options and, if they choose, will receive 50% of all exposures of the ad. All in all, the process is extremely simple but it is worth noting that Embed Anything is NOT intended to offer any image protections. Users can very easily still right click the image to save it as the overlay does nothing to block any normal user interactions, other than adding the box on mouseover. Focusing solely on the image functionality, with the article technology having been previously covered, there is little doubt that the setup and install is as simple as can be, easier than even the almost-as-simple article version. The system also seems to work well. It is unobtrusive to visitors of the site using it, not interfering with any typical behavior, but still offers a clear and polite hint to embed the content via this method and not downloading and reusing, likely unlawfully. On that front, once the code is placed into a visitor’s site, it seems to work very well, providing a text link back to the source and, when possible, overlaying an ad, which may or may not be appealing depending upon your goals. In short, the system does exactly what it says it will do but there are several caveats and limitations to be aware of before placing the code on your site. In exchange for the simplicity of Embed Anything you sacrifice features and customization. There is no way to disable the ad, change the look and feel of the “Embed Image” box nor alter the images it appears on beyond using a special image class, class=”emba_no_img”, to indicate that you don’t want the overlay applied. This means that, with Embed Anything, what you see is what you get. If you don’t like the way it operates, you are simply out of luck. There isn’t much more that you can do as even the WordPress plugin only has one option, to add the publisher ID. As far as the ad goes, many aren’t going to want to display the ad and those who do may feel the 50/50 adspace split is a bit low. To make matters worse, it is unclear if and how this would work with Google Adsense TOS, especially if the images were placed on sites that violated some element of those terms. Likewise, I am not sure how useful the link back will be. There is no way to alter the link text to prove attribution to your site. It simply says “See more images here…” and links to the source. There’s no mention of the site’s name or the who created the image. Finally, there simply isn’t a great deal of intelligence within the Embed Anything system. Though ads won’t appear on images that are too small, the system will automatically apply to all images, regardless of size, location, etc. included in your site. There is no way to tell the system to only offer embeds for images of certain sizes, names, locations, etc. and images such as your logo will also have the overlay (as you can see above). In short, the system works as advertised and do so very easily, but don’t expect any bells and whistles. This is meant to be a streamlined experience for both parties and, unfortunately, that comes at the price of options and features. Personally, I can’t see that many webmasters, bloggers and/or artists using this service as it is. Not only is it too limited in terms of customization, but it is just not a feature it seems many were clamoring for, at least outside of the mainstream media. 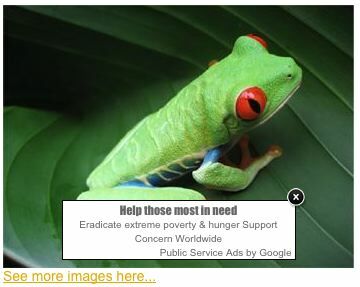 Granted, at least one photography group, Picture Group, has integrated Embed Anything into their site. However, they did it with a heavily customized version, not the code or features offered in the stock version. So, unless you have a highly specific need for such embedding and the capability to customize it to make it work as you want, you likely aren’t going to find this service very compelling. That being said, for those whose needs fit what Embed Anything is offering, they will likely find this service to be a godsend. As usual with these types of reviews, I’ve enabled Embed Anything’s image service on this article so you are free to play around with it, even though it seems a bit odd to use Embed Anything to embed screenshots of Embed Anything’s service. Play with it and decide for yourself it is right for you, it is truly the best way to decide. Update 8/4: Have now notices an additional problem with Embed Anything, it messes up image alignment, at least on my blog. You can see this at the top with the Embed Anything logo, which should be pushed to the left and, instead, has the equivalent of alignnone. Next article3 Count: Huzzah Kazaa?